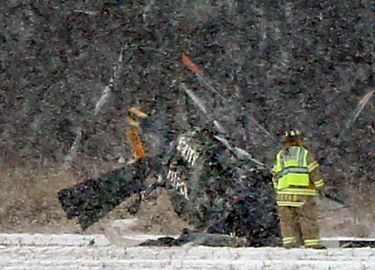 STONY RIDGE, Ohio (AP) — A helicopter used for inspecting power lines has crashed into a snowy Ohio field, killing the two men on board. It’s not clear what caused the crash around midday Monday just south of the Ohio Turnpike in Wood County. Sheriff Mark Wasylyshyn says there was no sign of fire and no indication that the aircraft hit any utility lines. FirstEnergy spokesman Doug Colafella tells The Blade that the victims were contractors for the utility. He didn’t disclose the names of the men or their employer but said the contractor was working to notify the victims’ families. The Federal Aviation Administration and the National Transportation Safety Board were expected to send investigators to the scene.